Whether you are using a manufacturer coupon with a Walmart logo at BJ’s, Target or any other retailer there are common mistakes concerning this coupon. Don’t be fooled by the marketing ad on the coupon. Don’t you hate it when you print a coupon and then you see ” Redeemable only at Walmart” You wanted to use that at BJ’s but now you can’t. WRONG. You CAN! Here is a breakdown of this confusing coupon. I am told this statement frequently. Anyways, they are good. So good with their marketing. And competitive. Their prices are not bad regular price. Their organic line is expanding and the prices won’t break the bank. So of course, they are going to pay for the smartest marketing strategies. Putting their name on coupons is one. BJ’s doesn’t have anything in its coupon policy stating a coupon with a store’s logo can not be used there. If an employee is giving you a hard time I would reach out to corporate. When you see “Redeemable at Walmart”– this is a suggestion. Walmart paid for that advertising and is hoping you see their name and head to their store. You can indeed use this coupon at any store that accepts manufacturer coupons. When you see “Available at Walmart”– this is a suggestion too. HEY HEY- this item is at Walmart better go there. But you are becoming a smart savvy saver. You know there may be a better deal elsewhere. When you see “Redeem only at Walmart” this means you can only use it at Walmart. When you see the Walmart logo on a coupon you can redeem anywhere, but keep in mind some stores have changed their coupon policy to not allow a coupon if it has another store’s logo. The Dollar Tree in Batavia- Boy did I have some bad experiences. So much I wanted to share the post on here but I let it go. They would not accept a manufacturer printed coupon that had just the logo on it because they said it was only good at Walmart. See. Walmart is a genius. Here is what it looks like on coupons.com and sometimes doesn’t print with a logo on it. Redeemable at Walmart– if it is a manufacturer coupon you can use anywhere that accepts coupons. Available at Walmart-if it is a manufacturer coupon you can use anywhere that accepts coupons. Walmart Logo-if it is a manufacturer coupon you can use anywhere that accepts coupons. 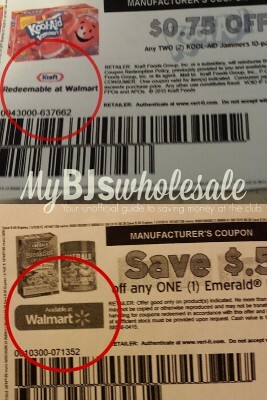 Sometimes you will see the Walmart logo on the coupon BEFORE you print and then it doesn’t show up on the actual coupon! Redeemable ONLY at Walmart- use only at Walmart. Just be sure it has the word ONLY. Has this coupon stumped you before?! Are you excited to know some of the best coupons you thought could only be used at Walmart can be used now at a local grocery store that doubles the value?! Until Walmart starts doubling coupons- we can still get some AMAZING Bargains at our local grocery stores and BJ’s!